The CI is starting now. 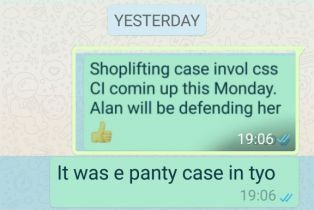 Looks like Alan will put up a strong defence. I do not think CSS will get away scot free but will not be sacked like the CSS in JNB case under Tony S.
I have never come across any person kena CI/DI and come out scott free and smiling. The legal team has prepared a case file for all accused just like how they charge criminals in state court. If there is insufficient evidence etc, Seth See will be tasked to send the accused an email and resume flying. Just a small lowly waitressing job must subject to a trial just like a criminal with SMCOMP acting as DPP, SVPs acting as judges and union acting as defending lawyers. Must call out witnesses to give testimony 1 by 1. What a joke! "...Just a small lowly waitressing job must subject to a trial just like a criminal with SMCOMP acting as DPP, SVPs acting as judges and union acting as defending lawyers. Must call out witnesses to give testimony 1 by 1. What a joke!.." Its a circus performance for the benefit of new union reps, newly promoted managers, etc. The decision has already been made, weeks ago. This just to comply with "due process" to meet MOM Employment Act... and in doing so, might as well incorporate it as a learning session for relevant parties. It also gives the illusion of effective labour representation and integrity of management. The loser is always the star.